Hiroshima is a big city! Time to go back to the traditional capsule hotel which is very convenient, very cheap for a solo traveller and very minimalist indeed. I've planned to spend 2 nights there, one day in Hiroshima and an other on Miyajima Island. After dropping my bag at the hotel I went to visit the memorial, walking around I could feel the cold while standing on the bridge. Travelling from one district to an other the weather is totally different, even in the mountains of Kyushu it wasn't so cold. I walked around, a lot of tourists, a lot of schools are there as well to visit and pay respect. This is a very special place. Everything has been rebuild of course, but there is this building which is kept as it is. To remember and never forget what happen. It's hard to imagine what happen here years ago. 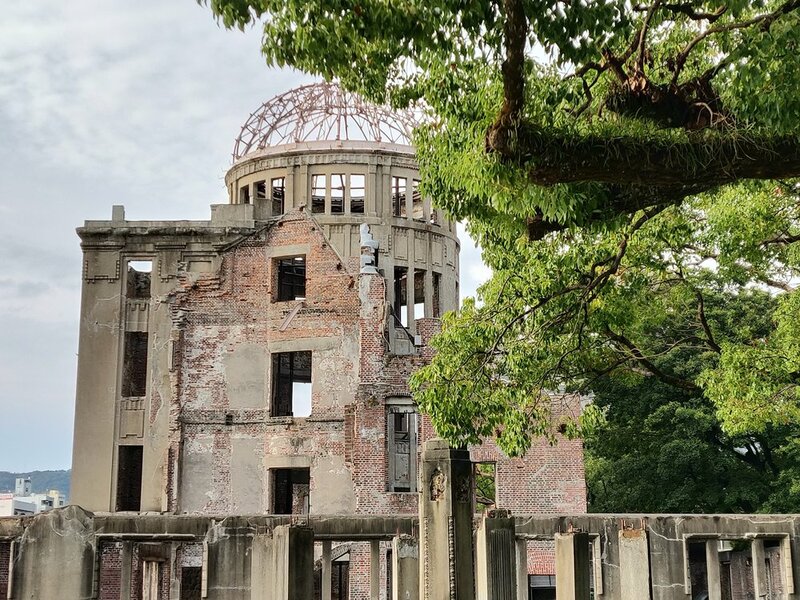 Hiroshima is a nice city, while coming to the memorial I noticed some nice cafes along the river. There is a child peace memorial there about Sadako Sasaki and for all the child who suffer from war. I was lucky to assist to a school giving a senbazuru (1000 cranes origami) and ringing the bell and singing. 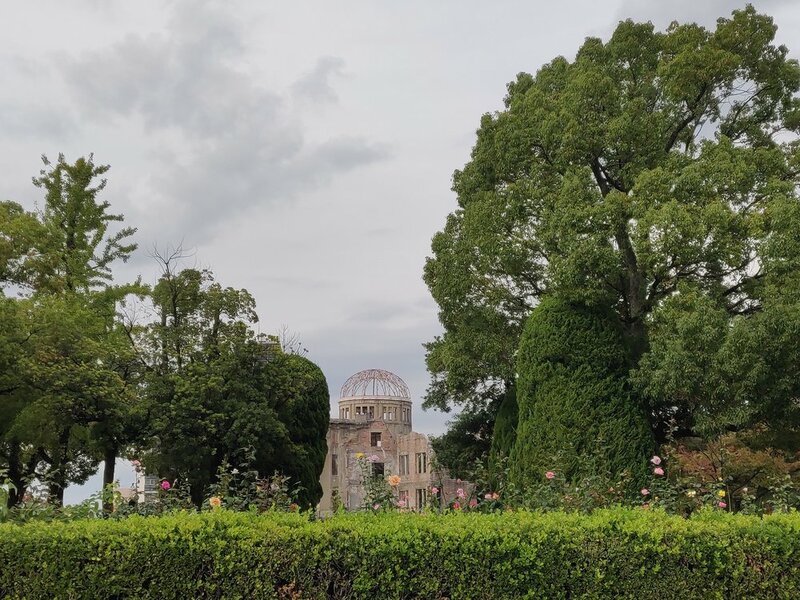 During the war Sadako Sasaki was 2 years old and was 2km from the center of the impact of the Bomb on the 6 of August 1945 at 8h15. This day she wasn't hurt and she grown up normally. In 1954 when she was 12, she was diagnosed a Leucemia. Her best friend told her the story of the 1000 cranes. If you could fold a thousand cranes you'll have a wish granted by the gods. At the hospital Sadako fold 644 cranes and died from leucemia. His school finish the remaining cranes for Sadako. Now from all around the world crane is a symbol of peace. And many schools are folding thousands cranes for peace. Then it was night very quickly and I went back to my capsule. When you are traveling alone most of the evening are very quiet, quick diner, walk the city by night and then time to sleep. I woke up early to take the ferry to Miyajima , It's a very quick one, 15 minutes and it work with JR pass. Perfect! This Island is really cool to walk around, you got a nice 2h30 walk in the mountains where you can see some Temples. And of course the main attraction is the Big Tori laying in the ocean which you can walk to if you wait for the good time of the tide. I was lucky and early enough to see both. 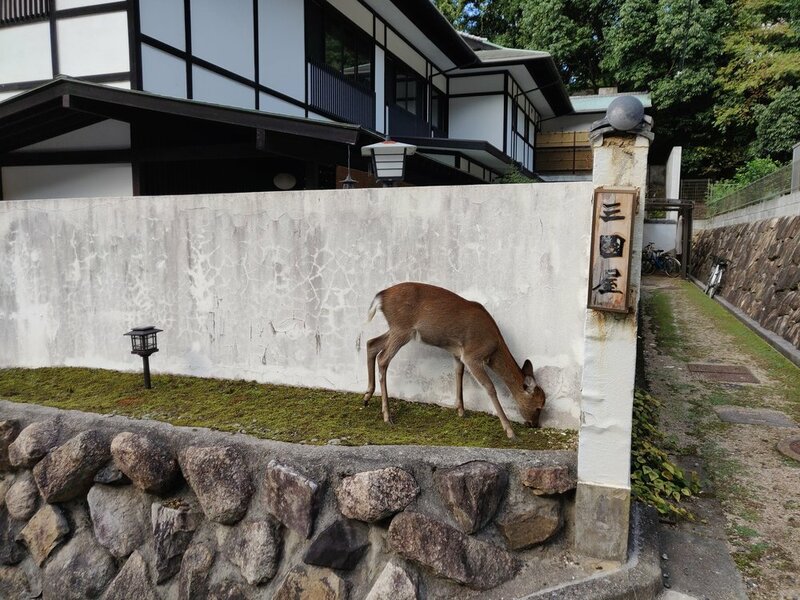 You can meet some deers on this island like in Nara, but a bit less. Sometime some questions come back to me : what's next? Job? Next adventure? Next year? Where to go tomorrow? Before I left UK, I red an interesting book about Ikigai. The purpose of your life which make you help people, be happy, live... Etc... All together should connect to become your Ikigai.